There's still love in the world. There's still hope, too. I know, because I feasted on both this past Saturday. This weekend, I married my best friend all over again. She looks a little different than she did 20 years ago, but then again, so do I. Back then, I had fewer wrinkles. Back then, and she wore a suit and tie. All pics in this post, except that first selfie, were taken by our talented photographer and friend Dani Donders. You can find more of her incredible work on her website. She had a different name back then, too. A masculine one attached to a person who is anything but masculine. When I think back to our first wedding, it feels like I'm watching someone else's. There was someone who looked like a guy there, standing with groomsmen, wearing a tux, and I was walking towards that person, and saying vows to that person, and none of it feels real anymore. Because the person I married this weekend, the person I love, is a woman. And she looks far more fetching in a dress than she ever did in a suit. Thanks to our friend Jennifer Mae Bennett, face goddess extraordinaire, for doing our makeup way better than we ever could. I don't remember crying the first time. Maybe I did. Who knows? But I will never forget crying this time, as I told my love she's the roots that ground me, the light I can always find in the darkness, and the rainbow awaiting me each time a storm passes. I promised to be all the things you normally promise a spouse, including the person who sits with her on the couch in yoga pants watching TV at the end of a long day (#goals). I meant every word, and I will forever be grateful for waterproof mascara. I know a vow renewal doesn't change anything from a legal standpoint. We were married before, and we are no more married today. But I would be lying if I said nothing is different. Something did change, and we both felt it when we woke up the next morning, still exhausted, curled up in bed together, fingers interlaced with new matching silver bands. "Good morning, wife," she said to me. "Good morning, wife" I replied. Basically my favourite wedding photo of all time. Whether we fully realized it or not, this ceremony was the new beginning we needed. No more hiding. No more trying to be something we're not. 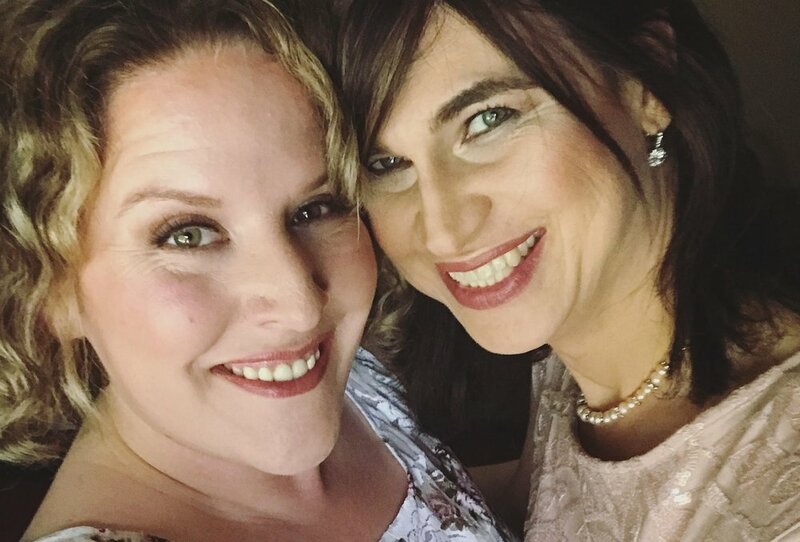 We are two women in love, and that's what we need to be celebrating. And this is why both Zoe and I feel a real shift in our relationship since this weekend. A validation, a solidification, a deeper love than we've ever had. Everything clicks just slightly better into place. This is what love looks like. Right here. It doesn't have to be in the typical package of boy meets girl. Sometimes it's girl meets girl, except one girl doesn't know the other girl is a girl because the girl is hiding from a society that wasn't welcoming to anything but what it could see on the surface, but when that girl finds out the first girl is a girl, she's over-the-moon happy because she loves girls! Hey, nobody said love isn't messy. But their families? Well, they love them all the same. 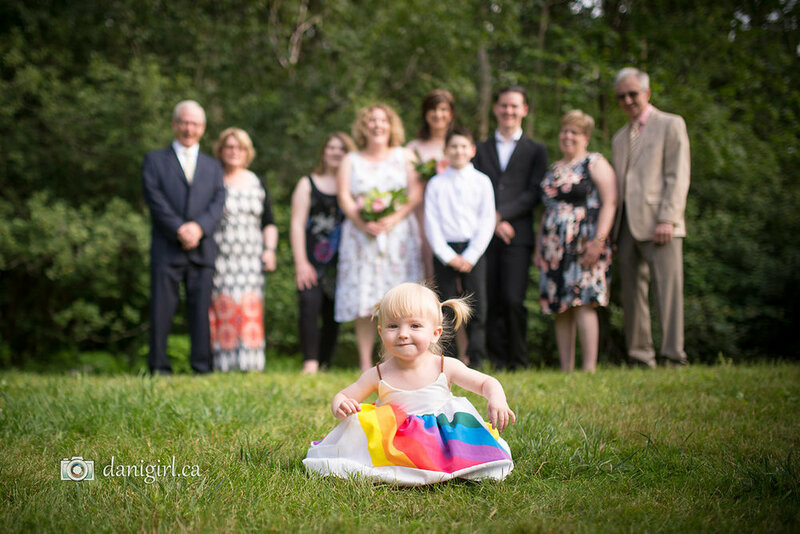 Our niece, Alexa, was the world's best flower girl. How many people get new beginnings 20 years after their nuptials? Not many, which is why I count myself lucky. This crazy, unpredictable life has been laced with gifts I never knew I needed. I can't imagine it any other way. Two years ago, I didn't think we were going to make it through what was the most challenging time of our relationship. Three days ago, I put a ring on it - again - and nothing has ever felt more right. So here's to new beginnings, to love, and to hope. We have some of it, and the world needs some of it, so we're going to keep sharing it all over the damn place. Let's tell happy stories. Let's share joyful moments. Let's not forget that love is the fuel that pushes away the darkness. It was supposed to storm on Saturday afternoon. A 70% chance. I was a total bridezilla about it all day. And yet, the skies parted, the day stayed dry and warm, and we were able to celebrate for hours without a drop of rain. If parting the skies for a gay wedding doesn't show support from any Powers That May Be, I don't know what does. Someone else appreciates love in all its forms, too. Now, if only I could find someone to come take the rest of this wedding cake off our hands so I stop eating it for lunch, snack, after-snack snack and post-dinner delights, I'd be all set.